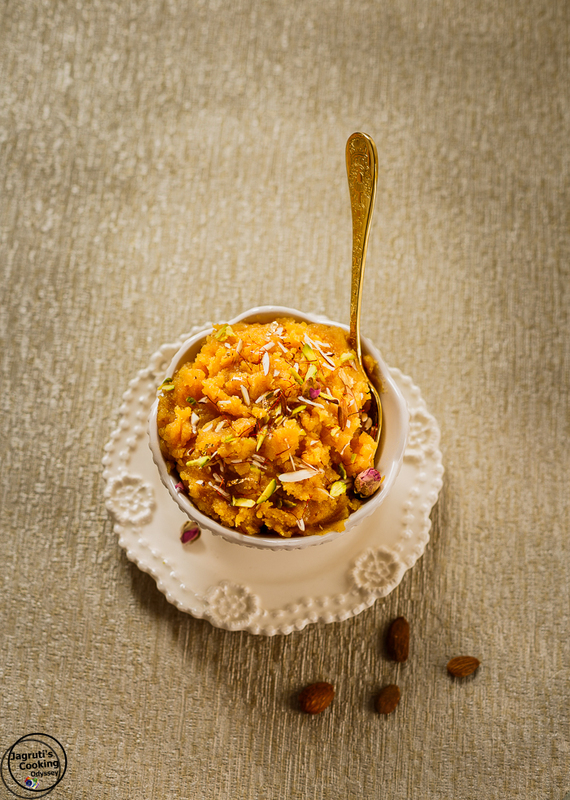 Let me warn you this Badam Besan Ka Halwa is sinful, but you don't want to commit a sin by not eating it too! 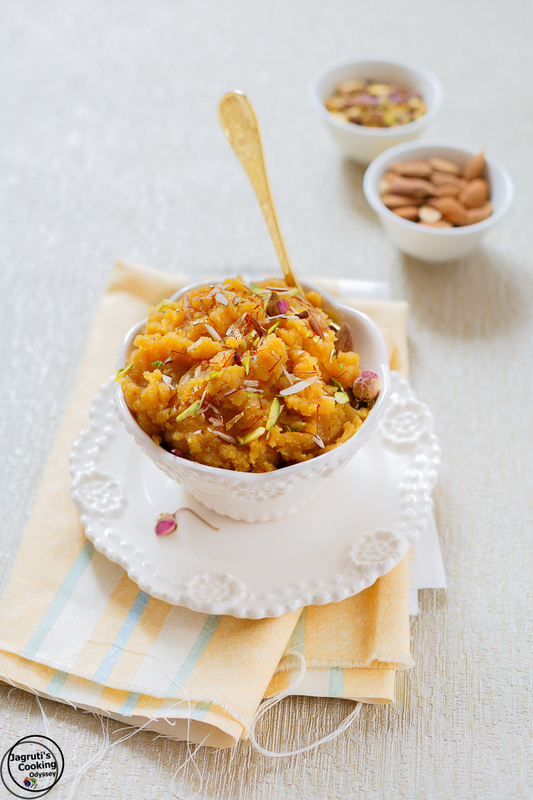 My Badam Besan Ka Halwa is rich and divine but is surprisingly easy to make. It is enriched with nutty ground almonds, Mawa, aromatic spices and a generous amount of desi ghee. In result, this halwa turned out so delicious, fluffy, velvety and melt in your mouth. This is a real treat for any festivals, celebrations or get together. Besan Ka halwa is a classic north Indian sweet which is prepared with only Chickpea or Gram flour (a.k.a. Besan) milk and sugar, but my mum always prepared this halwa with Mawa or Khoya as she was very much fond of using khoya in her cooking and also I learnt something else from her that if you want your besan halwa to not stick in your mouth, roast chick pea flour properly and don't rush. Maybe this recipe is easy to prepare but will take time and patience. Last week daughter had an exam, so I wanted her to have fresh food during her exam. She just wanted to eat Badam(Almond) Ka halwa with Chickpea curry and Paratha. 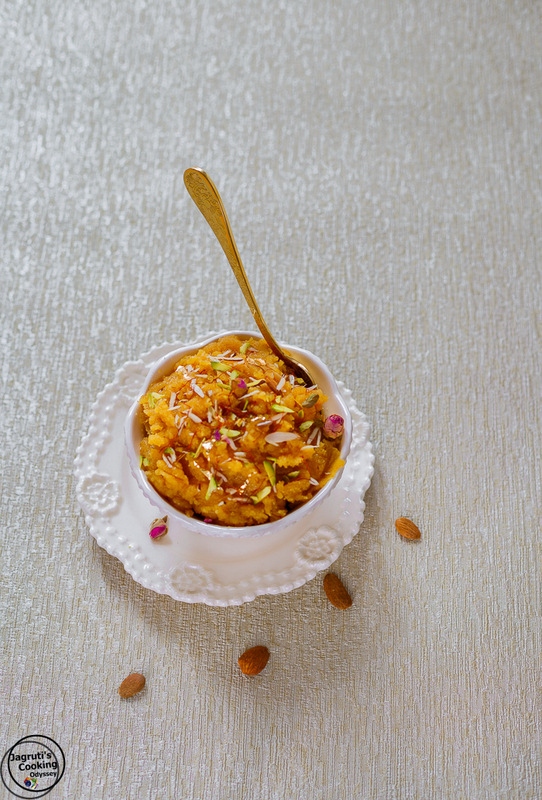 Once I put the phone down, I thought about making Badam Besan Ka Halwa as I thought that alongside feeding my daughter, my blog needed some feeding too with new recipes! So I prepared few dishes which are favourite of hers and took with us. She immensely enjoyed it and so did my whole family too. Now that are so many Indian festivals are lined up for us in next couple of months, I am sure many of you are searching traditional and innovative recipes, how about trying this one? It's a real soul satisfying treat! For vegan option omit khoya, milk and ghee, use dairy free products such as coconut oil and dairy free milk. 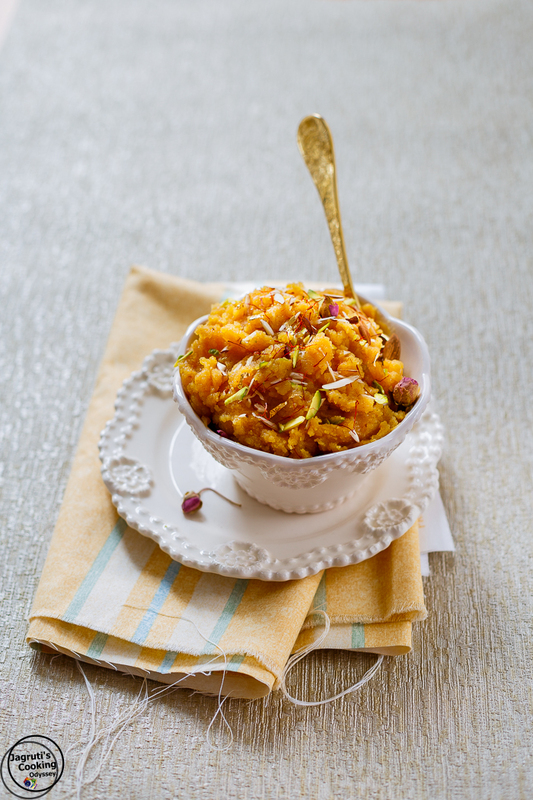 Badam Besan Ka Halwa is a rich and delicious Indian Sweet, which is perfect for any celebrations or occasions. It is prepared with ground almonds, chick pea flour, khoya, sugar and milk and garnished with rich nuts, saffron and edible gold leaf. It's a real soul satisfying treat! In a heavy bottom pan heat ghee and add chick pea flour.Keep the heat very low and roast the flour, make sure flour doesn't burn.Keep stirring the flour, until you get the beautiful aroma of roasting flour and flour changes its colour to light brown.Now add almond flour and roast the mix for another couple of minutes.Then add grated khoya and keep stirring the mixture for few minutes.Add milk and keep stirring the mixture continuously to make sure that mixture stays smooth. Once the mixture gets slightly thicker, add sugar.Mix well and keep stirring the mixture until halwa reaches the right consistency. 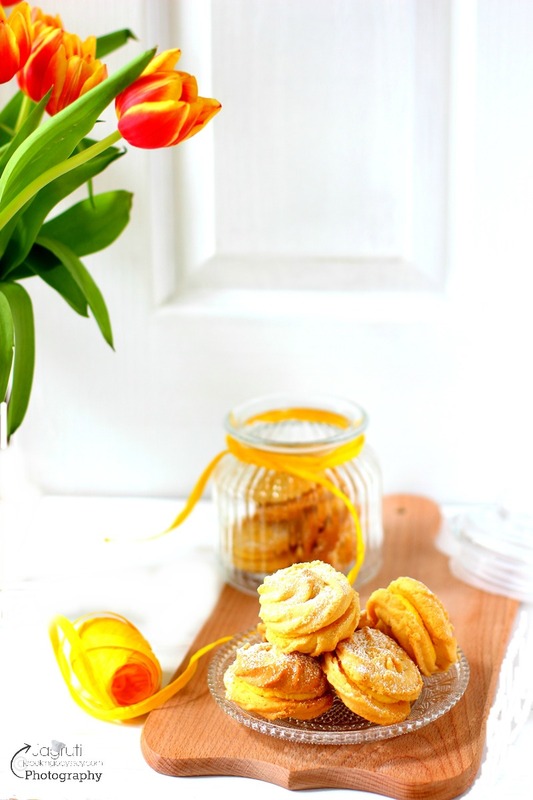 Add cardamom and nutmeg powder.Serve hot in a serving bowl, garnish it with saffron threads, slivers , flowers and gold leaf.Enjoy! I would love to have a bowl of that halwa... looks delish! Your photography is beautiful! And the recipe itself looks delicious. What an unusual recipe. I would love to try it right now. I have never tried anything like that before, but it looks so beautiful and interesting. Must try! Ooh I've never tried anything like this before! It looks so lovely. What a delicious sounding dessert! I love all the spices! What lovely photos, too! How unique!! It looks beautiful, and would be really a different sweet treat to have for a change. This looks and sounds so exotic! I've never had anything like it, but I sure would like to dip my spoon in that bowl for a taste! How lucky is your daughter to have a mom who can make amazing dishes like this for her exam prep! This looks really interesting - I love your photos but then you always take such amazing images! The halwa looks amazing. Its lovely that you are able to make such delicious food for your children. I love your bowl and spoon! The halwa looks so tempting never tried this combination will try your lovely recipe soon. This pudding/halwa sounds delicious! I'd love to use pistachios. Thanks! Goood info. 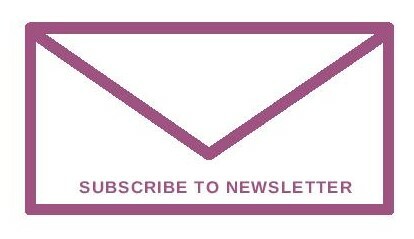 Lucky me I ran across your site by hance (stumbleupon). Such an ultimate halwa, just love besan halwa very much, am sure the addition of badam makes it more interesting and nutty as well. Delicious and irresistible sweet.